Thanks to Sarah Layden for the heads up. 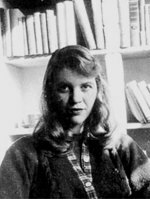 Seems that Anna Journey, winner of Sycamore’s 2005 Wabash Prize for Poetry, has discovered a previously unpublished Sylvia Plath poem in the archives at Indiana University. The poem appears to be a reaction to Fitzgerald’s The Great Gatsby written in Plath’s senior year in college. It will be published in Blackbird, VCU’s online literary magazine (as soon as tomorrow, if their site is to be believed). Read Anna Journey’s Sappho at the Edge of the Bayou, winner of the Wabash Prize for Poetry, in Issue 18.1.